Who made this ring, please? This lady's gold ring has natural freshwater pearls in the setting and looks to be about a hundred years old. It has a small faded gilt-covered cardboard box typical of that era with two folds of velvet inside to hold the ring in place. The box has Jolly & Wynne Jewelry Co. Raleigh, NC. printed on it. 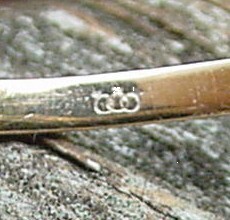 Is there a specific goldsmith you might know of besides the jewelers who may have made this? Thank you.